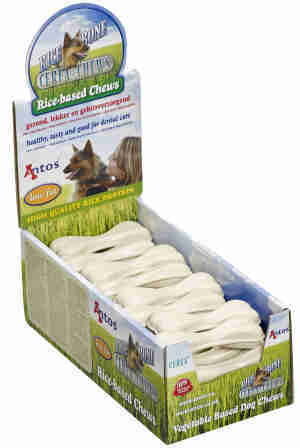 Antos Snacks Rice Bone are very hard vegetable based chewing snacks for small & medium dogs..
A little harder than other veggie snacks, the rice bone contains hypoallergenic potato and rice protein, instead of wheat. The Rice Bone is hollow at the back which creates a fantastic shape for cleaning teeth and playing. Supplementary food for small-medium adult dogs. Give 1 treat a day. Please reduce main meals accordingly and always povide access to fresh water. Our dog loves these bones and because she is fairly intolerant of protein, these cereal based treats are ideal. She only gets them at weekends and you can almost see her counting off the weekdays! My dog likes these and I'm happy for her to have them as they are very low in fat, made from completely natural ingredients, and nice and hard to help keep her teeth clean. The only downside is they are quite expensive, but buying the bulk pack does help keep the cost down. My poodle loves these and as they are rice are ok with his allergies. They are great for cleaning teeth and every day he has one, hides it then gets it later to eat before bed. Works for him! I bought this product when my miniature poodle became allergic to something. Vet approved content and he loves them. Every bone he buries it then eats it later. The content is pure and it's good for teeth cleaning. Although they feel hard, there appears to be a chewiness to them too. Ria cannot manage bones - not even the "soft" antlers. These are a treat and entertainment. I put a Natures Menu meat treat in the back gap at either end for added puzzling.